Two firms which have received individually $40 million cost sharing grants from the U.S. Department of Energy (DOE) for work on advanced nuclear reactor technologies have joined forces. The objective of the partnership is to come up with more options to produce designs with high levels of performance. The firms have set a target to achieve commercial success by the 2030 time frame. X-Energy and Southern Co. have signed a memorandum of understanding that pools their efforts. What’s interesting about the partnership is that the DOE grants support two very different types of advanced reactors. The X-Energy start-up is working on a pebble bed high temperature gas cooled reactor. 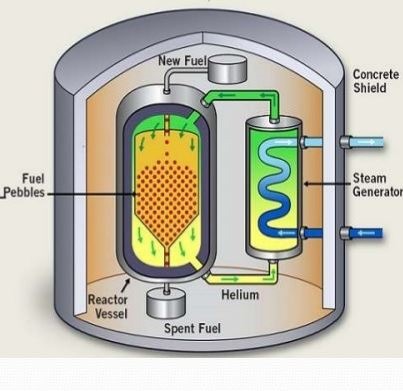 Southern Co. is developing a molten chloride (salt) fast reactor. Both firms bring to the table sets of partners that read like a who’s who of nuclear energy. X-Energy is working with BWXT, Oregon State University, Teledyne-Brown Engineering, SGL Group, and two DOE labs – INL and ORNL. Southern has partnerships with TerraPower, the Electric Power Research Institute, Vanderbilt University, and ORNL. Does Triso Fuel Hold the Keys to the Partnership? Neither Southern nor X-Energy have explained in their press statements where their R&D work intersects. The potential technological link between the two projects is Triso fuel. Some GEN IV designs of very high temperature molten salt reactors specify the use of it. The pebble bed design depends entirely on Triso fuel. As one the biggest nuclear utilities in the country, Southern has broken new ground for the second time. First, it sought and won a $40 million cost sharing grant from DOE for advanced R&D work. Second, it brought to the table an innovative small startup seeking to leverage its similar DOE grant, and equity investments, with a larger partner and potential customer. X-Energy’s pebble bed work involves TRISO fuel in the form of 200,000 ceramic clad enriched uranium pebbles inside the reactor pressure vessel. Helium is heated there to very high temperatures and some pebble bed designs have specified outlet temperatures as high as 500C.or more. Some molten salt reactor designs call for temperatures within the primary loop up to two-to-three times that level. In addition to the fuel and reactor design issues, X-Energy will also need work on materials which can stand up to the high heat. MIT’s Department of Nuclear Science and Engineering has a resource web site on pebble bed reactors which provides additional insights into the history of the technology and some of its perceived advantages. Southern’s work plans to use molten chloride salts as a primary coolant at low pressure. It is a less known version of the molten fluoride salt reactor. 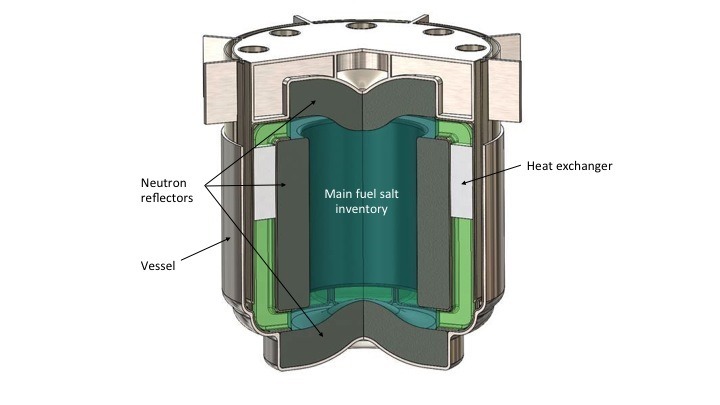 TerraPower, one of Southern’s partners, has been exploring options for design of a molten chloride salt reactor since last year when it announced the effort during a nuclear energy conference at ORNL. While few technical details of the design have been released by Southern Nuclear, this online discussion posted in January 2016 by thorium reactor expert Kirk Sorensen explores some of what’s known about the technology in general. See also this report by Nuclear Engineering International which survey’s current molten salt R&D efforts as of February 2016. In August 2016 MIT Technology Review published a description of molten salt R&D efforts taking place in China. In press statements reported by World Nuclear News, the CEOs of both X-Energy and Southern talked about bringing an advanced nuclear reactor to market. The collaboration of so many high profile nuclear energy players on advanced reactor designs adds a new layer of interest to the many entrepreneurial efforts going on elsewhere in the U.S. and Canada. While DOE had emphasized the development of public / private partnerships through its GAIN program at INL, it appears another path is opening for developers, and that is to partner with a major nuclear utility. The question now becomes whether other large US nuclear utilities will look at Southern’s model and invest in an R&D partnership with an entrepreneurial developer. The benefits to the developer are the deeper pockets of the the utility and a potential customer for its efforts if to makes it to the finish line with a successful NRC safety design review. Southern CEO Steve Kuczynski has spoken frequently about an objective of the US having 40% of its electricity coming from nuclear reactors by 2040. The firm is building two new Westinghouse 1150 MW AP1000 reactors in Georgia and will complete them to enter revenue service before the end of this decade. Other large nuclear utilities have expressed interest in small modular reactors (SMRs) which are based on conventi0nal light water reactor technologies and which have a strong case for passing an NRC review. UAMPS, a Utah electric cooperative, is the first customer for a 50 MW SMR design by NuScale which is slated to be built in Idaho. Up to 12 of the units may eventually be built at the site which is about 50 miles west of Idaho Falls, ID, on the grounds of the Idaho National Laboratory. At one time TVA was working with B&W to design and license that firm’s 180 MW mPower SMR, but opted instead to seek an NRC early site permit for the Clinch River plant without selecting a specific vendor. B&W has since paired with Bechtel to seek a new customer for its mPower design. I admit that TRISO fuel is desirable from an accident-stability viewpoint, but that falls well behind other considerations IMO. It appears nearly impossible to reprocess TRISO fuel, so not only the unused fuel fraction but also the incorporated carbon isolator/moderator becomes waste as well. Straight carbide, nitride or even oxide fuels might be able to produce similar output temperatures, let alone molten fluorides or chlorides. Gas cooling is far from a panacea; the need for a high-pressure helium vessel imposes costs similar to that of pressurized water reactors. There are many applications in which high-temperature heat is either required or greatly desirable. Ideally, nuclear heat sources should supply such heat with as few/cheap material and structural requirements as possible. I see molten-salt systems doing well at this, but not gas-cooled ones.